Adam (Sandy Robson) lives as a recluse in a cabin in the woods, and as such he has become very peculiar, has picked up all sorts of strange habits - including shaving his whole head and going jogging barefoot every morning, photographing himself in a crucified position everyday and being obsessed with the number 4. The only person he ever lets near him is Grace (Bronwen Smith), the food delivery girl, but even her he keeps at a distance. Then one day when jogging, he's surprised by a mind-numbing noise that actually seems to follow him and that completely throws him off. He tells Grace about this, and almost against his expectations she totally believes him and even researches the internet for people with similar experiences. And when the thing seems to get too big for Adam alone, she just forces her way into his cabin, something he is horrified about at first but soon grows used to. However, by now he's also terrorized by his own mirror image and a boy (Aidan Kokotilo-Moen), who appears at irregular intervals and seems to have a clue to the whole thing. And then an alien attacks the cabin and ... the whole thing might be one fact away from the actual reality, Adam might be just a madman and Grace someone else than just his food delivery girl - but then again, who says this reality's real? 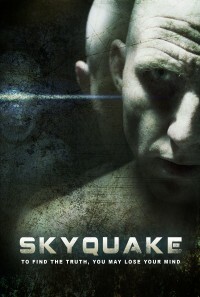 I don't know if above synopsis makes perfect sense, and if not, then I figure it's rather accurate as Skyquake is one (intentional) mindfuck of a film that is open to all sorts of interpretation and that refuses to give simple answers (or answers at all one might argue) to the questions it raises, despite the new angles the ending offers - or seems to offer. Now add to that a direction with a feeling for the somewhat out-of-place to add weirdness to the story without overpowering it and a solid cast - and you've got yourself a really nice little oddity!